A flagship Fairtrade project that produces roses for some of Britain’s biggest supermarkets has been embroiled in a corruption investigation. Oserian, which supplies Sainsbury’s, Morrisons, the Co-op and Aldi with cut flowers from Kenya, ordered a forensic audit into the way $1m (£760,000) of Fairtrade funds were distributed by community representatives amid allegations bribes had been paid for bursaries. It instructed independent accountant Clyde and Associates to investigate any misappropriation of funds and to “establish exact amounts embezzled”.The investigation also looked into a raft of concerns including poor or non-existent record keeping and lax controls. The report, seen by the Guardian, discovered a host of financial irregularities and a misappropriation of funds which have raised fears about the effectiveness of the controls in place at Fairtrade projects. Top of the list of concerns flagged in the report was the “awarding of bursaries to non-qualifying beneficiaries”, but it also found a “disbursement of grants without approval” and “procurement irregularities”. But the report, produced last year, said: “We randomly selected 10% of the institutions that received payments disbursed as bursaries. We selected 67 institutions across the years and out of these 29 did not have supporting schedules showing who the beneficiaries of the bursaries were. The investigation also discovered 33 out of a sample of 162 beneficiaries were still awarded bursaries despite failing to adhere to procedures stipulated in Fairtrade’s education policy, while 10 beneficiaries were awarded bursaries despite not being employees of Oserian at the time. In the distribution of food for people with HIV/Aids there was a disbursement of grants without approval. Some computers were “misappropriated” along with “furniture and fittings” and there was also a failure to recover loans from a microfinance scheme. A spokesman for Sainsbury’s, which stocks Oserian’s Fairtrade roses, said: “We are aware of this report and have brought this to the attention of the Fairtrade Foundation. 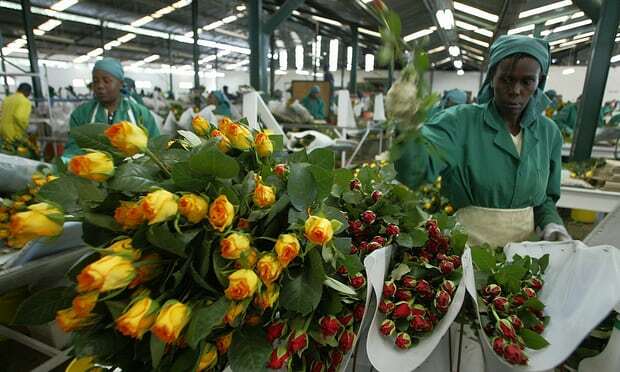 The Oserian plantation is Africa’s largest producer of roses and carnations. It started as a small vegetable plot with only six employees, but soon evolved into the first cut-flower farm in the country. It is now one of the largest in Kenya producing a million stems a day. Oserian also supplies flowers to Tesco, Asda, and Waitrose but not through the Fairtrade scheme. Fairtrade said the problems flagged in the report were due to a lack of adequate training and skills of the Fairtrade Premium Committee (FPC) – a group responsible for allocating funds to benefit the local community. When shoppers buy Oserian Fairtrade flowers in a British supermarket a portion of cash is set aside from the sale of the products. Fairtrade sums are forwarded to a communal fund for workers, farmers and the community, to improve their social, economic and environmental conditions. The FPC then manages the funds. Executives from Oserian do not play any part in the allocation of these funds, but have been actively trying to encourage Fairtrade to improve governance over its flagship projects. Neil Hellings, managing director of Oserian, said: “The premium has a seven-figure sum. It is effectively the size of a small business in its own right and it has some of the lowest [least qualified] people in the organisation running it. “The management were increasingly concerned at the way in which the premium was being allocated, the scope for abuse within that use, and that the FPC was heading toward insolvency and refusing all management attempts to guide them on the need to ‘cut their cloth’. The organisation has instigated a number of reforms. A financial consultant has been brought in to assist the FTC. Oserian management have also taken FPC members through training on management processes. Bursary cheques are now presented to schools by a project manager, and all financial decisions and records of receipts and expenditure are now published and displayed around the farm. However, the problems have persisted and the FPC committee has been disbanded for a second time. This has raised questions over whether measures taken to combat the problems are effective. The UK’s Fairtrade Foundation and Fairtrade Africa are part of a global network of Fairtrade bodies run out of Germany. They license the use of the Fairtrade mark on items sold and around 2.55p in every pound goes towards the premium, administration and the implementation of controls to ensure suppliers adhere to agreed standards, and suppliers also get a minimum price guarantee for products. Before Fairtrade was founded in 1992, Oserian was already offering workers free, stone-built housing with running water, sanitation, and security. A hospital, pharmacy, schools, and creches were provided free-of-charge by the business. In the mid 1990s people on the estate were also provided with free electricity. Hellings said: “We are proud of our ‘ethical DNA’ and, certainly during my three-year tenure, we have been highly challenging of Fairtrade and the need for it to recognise ‘one hat does not fit all’. Who is Yemi Osinbajo, the Man Quietly Running Nigeria in President Muhammadu Buhari’s Absence?